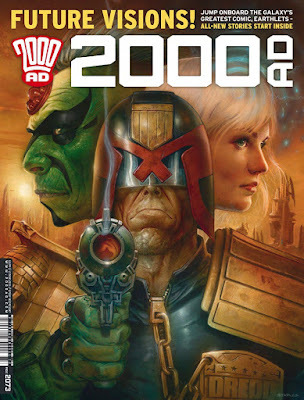 For those who are unaware of 2000AD, it is a British anthology series that features several different stories from different writers and artists in each issue. The company 2000AD has been around for over 40 years and is probably best known for introducing us to the character Judge Dredd and his violent futuristic world. This issue contains seven stories that feature Judge Dredd, Jaegir, Future Shocks, Sinister Dexter, Anderson, Psi-Division, Judge Fear, and Strontium Dog, with a cover from Greg Staples. What's so great about this issue is that it features an all-new set of stories, making it the perfect jumping on point for new readers. The first story is “Judge Dredd: Fit for Purpose” and was written by Rob Williams, illustrated by Chris Weston, colored by Dylan Teague, and lettered by Annie Parkhouse. Judge Dredd is the fiercest of all of the Judges, one of many trying to prevent total anarchy in Mega-City One, 2140 AD. Being such a tough Judge, leaves you with a limited number of allies. One of Dredd's main allies is Gerhart, a member of the SJS (internal affairs), who is set to be judged of his worthiness to remain on duty. Dredd is called in to provide evidence, which could also potentially put himself in danger. Weston's drawings do resemble the superhero look that you would expect from one of the major comic book companies, but there is enough of a difference to make it look distinctly like the 2000AD style. There is a great deal of action and intricate details with the environments, along with good facial expressions. The colors from Teague are what you might expect from a typical comic these days, but it does complement the art well. The second story is “Jaegir: In the Realm of Pyrrhus” and was written by Gordon Rennie, art by Simon Coleby, colored by Len O'Grady, and lettered by Ellie De Ville. Jaeger is part of the Nordland State Security Police, sent on a mission with her team to Nu Earth where there is a war going on against Southern forces. The story is short, but filled with tons of action both in space and on the planet. Coleby's art is terrific, with heavy black shading and highly detailed spaceships. The colors from O'Grady are filled with subdued purples, yellows, blues, and greens. This is definitely a story in which I cannot wait to see what's going to happen next. Next is the complete story “Future Shocks: Freedom Wears Faces” and was written by James Peaty, illustrated by Dylan Teague, and lettered by Simon Bowland. These stories are kind of similar to Black Mirror episodes, unusual cautionary tales set in a strange futuristic society. This tale is no different. Teague's art is what shines through in this tale, with only one page having any actual color. The rest of the pages are black and with grey shading, putting an wonderful emphasis on the actual details and style of the art. The fourth story is “Sinister Dexter: The Salad of Bad Cafe” and was written by Dan Abnett, illustrated by Steve Yeowell, colored by John Charles, and lettered by Ellie de Ville. The story involves Finnigan Sinister and Ramone Dexter, the best hitman in the future city of Downlode, hanging out in a diner while they wait for their next target. The art is very cartoony and similar to something like the classic newspaper comics, with 9 panels on each page except for the first page. It is primarily devoted to the two characters and their banter while hanging out at the table while they wait for their mark. This is followed by “Anderson, Psi-Division: Undertow” and was written by Emma Beeby, illustrated by David Roach, colored by Jose Villarrubia, and lettered by Simon Bowland. The Psi-Division is part of the Mega-City One Justice Department that consists of Judges with psychic talents, investigating various paranormal crimes. Anderson is their top telepath (seen in the film Dredd) and is investigating the murder of another psi-Judge with her partner. The art from Roach closely resembles the style of the Judge Dredd tale, which works since they exist in the same world. The sixth story is the one-off “Judge Fear: Memories Are Made of This” and was written by Kek-W, illustrated by Dan Cornwell, and lettered by Annie Parkhouse. Judge Fear is one of the Dark Judges, who come from a parallel dimension and believe that all life is a crime, thus everyone should be purged. Judge Fear is currently in a containment facility, shipped back from Earth in a suction trap. The Judges bring in a Psi-Judge to see if they can use him as some sort of weapon, which sounds like a very bad idea. The art from Cornwell is simply fantastic in all of its black and white glory. Color isn't always necessary and there is a definite old school underground comic feel to his art, which is filled with heavy black shading and intense action scenes. The final story is “Strontium Dog: The son” and was written by John Wagner, illustrated by Carlos Ezquerra, and lettered by Ellie de Ville. Set in the future after the Strontium 90 fallout, mutants have been forced into taking the only job available to them, bounty hunting. One of the Search/Destroy agents is Strontium Dog and this story begins with the S/D reopening for business. Beautifully drawn by the legendary Ezquerra (co-creator of Judge Dredd and Strontium Dog), the art is just rich in uniqueness and his specific style. If you haven’t been following 2000AD, now is the time to jump in and start. Go grab this issue and get caught up in some of these wonderful stories and artwork. The appealing aspect of this comic is that it offers up different stories with vastly different styles of artwork, so odds are that you should end enjoying at least one part of the whole.